The stock is down by 4% at Rs 20,321, falling 12% in past two days and trading near its 52-week low of Rs 20,301 touched on October 4, 2018, in the intra-day deals. 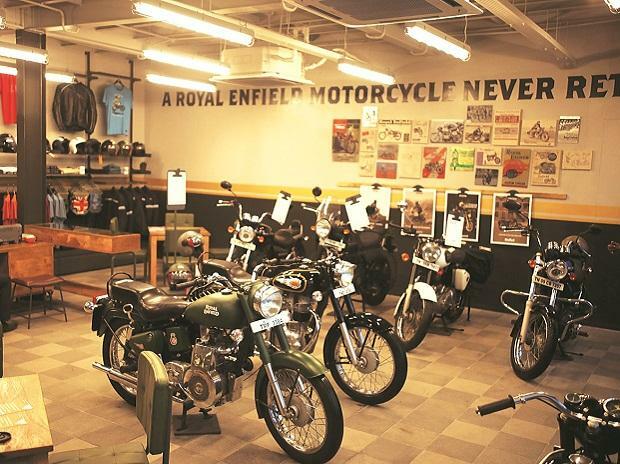 Shares of Eicher Motors hit three month low of Rs 20,321, down 4% on the BSE, falling 12% in the past two trading sessions after Royal Enfield (RE) reported a weak set of numbers for the month of December 2018. The stock was trading near its 52-week low of Rs 20,301 touched on October 4, 2018, in intra-day trade. The company reported a 13% year-on-year (Y-o-Y) decline in total sales at 58,278 units in December 2018. It had sold 66,968 motorcycles during the same month last year. On a month-on-month basis, the volume declined by 11%. It sold 65,744 motorcycles in November 2018. Sales of RE’s 350cc motorcycles, including the Classic 350, fell 15% to 53,790 units. Sales of models with an engine capacity up to 500cc, including the Himalayan and Classic 500 bikes, rose 21% to 4,488 units. Given that most of the high volume models (350cc variants) are now readily available and there is stagnation in demand, analysts don’t expect RE to continue to be immune to the overall domestic motorcycle demand scenario. Additionally, on top of it, RE for the first time would soon have a direct competitor for its Classic 350. “The company is increasingly emphasizing on expanding its presence in the international markets, which we feel would be long drawn strategy with no major volumes expected in the near to medium term and would be a drag on the margins. Volvo Eicher Commercial Vehicles (VECV) demand could benefit on account of pre buying related to BS-6 emission norm change,” analysts at Prabhudas Lilladher said in automobile sector update. “Despite production issues over the last few months, the waiting period for RE’s major models has declined consistently with dealership inventory now at 3- 4 weeks across regions. This clearly indicates that retail sales have been even weaker than reported wholesale dispatches over the past few months. Moreover, the strong response to the re-launch of Jawa brand will increase competition for RE,” analysts at SBICAP Securities said in company update. “This was the first month of no one-offs, as there have been multiple external factors influencing demand-supply since July 18. RE indicated broad-based weakness, but the magnitude of weakness has been a negative surprise. This weakness in demand might continue in near future, considering the substantial increase in cost of ownership (insurance, rear disc brake and ABS related) and Jawa has emerged as a reasonable alternative for potential RE customers,” analysts at Motilal Oswal Securities said in sector update.